"These easy cookies have a little bit of everything. The toffee bits keep them sweet and chewy, while the bittersweet chocolate chips add a richer flavor. You'll be surprised at how much you'll like the tart cranberries, too!" Preheat the oven to 350 degrees F (175 degrees C). Line 2 baking sheets with parchment paper. Combine butter, brown sugar, and white sugar in a large bowl; beat using an electric mixer until creamy. Beat in egg and vanilla extract. Stir in flour and baking soda. 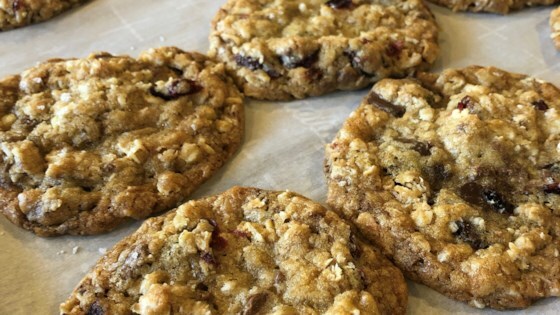 Fold in oats, chocolate chips, toffee, and cranberries. Drop heaping tablespoonfuls of the cookie dough on the lined baking sheets. Bake in the preheated oven until edges are golden, 12 to 15 minutes. Transfer cookies to wire racks to cool. Wonderful and delicious cookies! I made them just as the recipe is written. Made per recipe. Absolutely the BEST cookie I've ever had! However, next time will add pecans--a southern thing. LOVE 'em!! !.